Nov. 2, 2014 marked the 125th anniversary of statehood—the perfect time to celebrate the grand opening of the expanded North Dakota Heritage Center & State Museum. Experience North Dakota’s heritage throughout the museum spaces. Along with the galleries, hallway exhibits located within the Corridor of History also help tell our unique story. 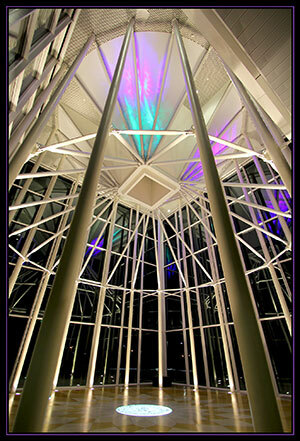 The Northern Lights Atrium is a stunning combination of architecture and symbolism, and the outdoor Pembina River Plaza features specimens from our geologic past. Find treasures in the new Museum Store, and enjoy refreshments at the James River Café. After you explore the museum, take a walk on our beautiful grounds, part of the Capitol Arboretum Trail. The North Dakota Heritage Center is home to the State Historical Society of North Dakota (SHSND) and the State Museum, the State Archives, the State Historical Society of North Dakota Foundation, and the North Dakota Geological Survey paleontologists. Admission is free, every day.